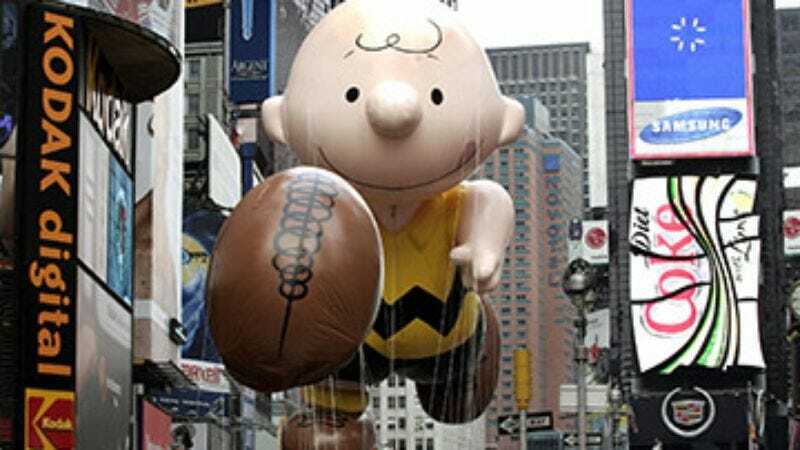 As animated Peanuts specials go, 1973's Emmy-winning A Charlie Brown Thanksgiving is pretty anemic and by-the-book: Lucy yanks the football out from under Charlie Brown before he can kick it. Sally gripes about schoolwork. Linus gives an erudite summation of the holiday's importance and history. And Charlie Brown is wishy-washy. There's a vague nod toward plot: Peppermint Patty calls and invites herself, Marcie, and Franklin across town to Thanksgiving dinner at Charlie Brown's place, unaware—since his only response to her is "Well, uh, I…"—that he's actually going to be at his grandmother's. At Linus' prompting, Snoopy prepares a kids' version of a home-cooked meal: toast, popcorn, jellybeans, and pretzel sticks. When Peppermint Patty complains about the lack of traditional turkey and cranberry sauce, Charlie Brown leaves the table in embarrassment; Peppermint Patty ends up sending Marcie to apologize. Which leads to the special's best exchange. Linus: "This is not unlike another famous Thanksgiving episode. Do you remember the story of John Alden and Priscilla Mullins and Captain Miles Standish?" Peppermint Patty: "This isn't like that at all." Really, though, A Charlie Brown Thanksgiving is most memorable for its extended Snoopy goofery, and the pleasantly jazzy, mournful song "Little Birdie," featuring longtime Charlie Brown composer Vince Guaraldi actually singing. A very young Kyra Sedgwick and a not-so-young David Carradine play a farm family who dig a well on their property and discover a mysterious unseen underground civilization that sends gold and jewels up the hole whenever Sedgwick sends food down. The cranky Carradine hates living off their largesse, so he heads into the well to take control of the riches under his feet, but when Sedgwick pulls his rope back up, she finds another load of precious metals, and a note thanking her for "the turkey." Nothing says holiday fun like a twist ending. The ironies pile up when Aunt Clara sends Darrin and Samantha (and, accidentally, nosy neighbor Gladys) to historical Salem to experience a traditional Thanksgiving. Through a series of mishaps, Darrin ends up being accused of witchcraft, and Samantha has to defend him. Later, she makes a turkey dinner, using her magical powers to keep the mashed potatoes from getting lumpy. In what's widely cited as one of the best episodes of the whole series, Bob and his buddies wind up going stag on Thanksgiving, so they get rip-roaring drunk and order Chinese food from The House Of Hu. By the time Bob is done on the phone, he's placed three orders for moo goo gai pan and one for "moo goo goo goo." Buried in the madcappery is a vein of real emotion, based equally on the despair of being single during the holidays, and the liberation of being able to dispense with tradition because no one really cares. NFL commentator John Madden provides what may be the most venerable Thanksgiving tradition in American sports, angry PETA activists aside. While pro football teams slam into each other on the playing field like sides of beef, Madden prepares his own meat collision in the broadcast booth, presenting a post-game Turducken feast to the winners. Years before gene splicing made artificially created Frankenfoods the unsettling cuisine trend of the age, Madden was stuffing chickens inside ducks, then shoving both of them inside turkeys like some kind of demented home-economics teacher, even grafting on extra legs to maximize the number of drumsticks to hand out. The resulting dish is probably tasty enough to make Homer Simpson drool, even if it looks a little like one of David Cronenberg's dreams. The gang winds up at Carla's house, where the side dishes are all set to go, while Norm's enormous turkey—dubbed "Birdzilla"—refuses to cook. The tension mounts as the peas get cold and the gravy congeals, and eventually a food fight breaks out. Who says you need a family to experience dysfunction? Our heroines get invited to four thanksgiving dinners, and proceed to binge their way across Stars Hollow. Anyone who's ever been annoyed by how much junk Lorelai and Rory eat—without ever gaining any weight—will especially hate this otherwise very entertaining episode, though it at least acknowledges that even the Gilmore girls have their gastronomical limits. It's history come to life Happy Days-style when Marion tries to get her Packers-obsessed family to appreciate the meaning of the holiday by recounting the story of the Pilgrims, as enacted by the regulars in 16th-century garb. (Fonzie rides a wooden motorcycle! Richie finds blueberries on Blueberry Hill!) The show sneaks in a lesson about racism when Pilgrim Fonzie tells Pilgrim Howard that the Indians are really our friends. Meanwhile, back in Milwaukee, the all-white cast enjoys their meal. The fourth-season Buffy Thanksgiving episode features some fairly mealy-mouthed debate about the holiday's real history and meaning: When a Native American spirit of vengeance starts slaughtering people (and infecting Xander with syphilis and smallpox) in symbolic revenge for his lost tribe, the Scooby gang argues about whether Thanksgiving is a celebration of togetherness or imperialistic bloodshed. But the episode is far more memorable for the manic banter and the many crossing plotlines, as a defanged Spike shows up seeking asylum and gets tied to a chair, Anya gets incorporated into the group as Xander's official girlfriend, and Buffy goes obsessively overboard trying to make the holiday perfect. And finally, Angel hovers in the background, trying to protect Buffy without revealing that he's back in town, which leads to one of Joss Whedon's typically stomach-dropping episode-enders. After spinning off from the hit Diff'rent Strokes, the non-hit sitcom Hello Larry frequently called on its mother show's cast to drum up better ratings. In the third and final team-up, prosaically titled "Thanksgiving Crossover," media-mogul-to-be Larry brings his family from Oregon to New York to look into managing a TV station, with financial help from Mr. Drummond. But the business deal strains their friendship and threatens their peaceful holiday dinner. Yank on that wishbone and call for a reconciliation, Arnold! In the original Japanese version of Iron Chef, the only theme ingredients more entertaining than the traditional Japanese ones were the more Western ones, which frequently baffled the contestants. In an "in honor of our new American viewers" Turkey Battle, Iron Chef Japanese Masaharu Morimoto damns the food poisoning and presses ahead with several dishes featuring turkey prepared practically raw. Hey, ptomaine beats tofurkey. During the brief interim between when Mad About You was merely irritating and when it became insufferable—during the third season, in other words—the series kicked out this funny bit of farce, which had Paul and Jamie hosting both sets of in-laws and dealing with their gripes about the lack of canned cranberry sauce and the absence of marshmallows on the sweet potatoes. The couple stands up for themselves and their right to host their Thanksgiving their way, until their dog Murray eats the turkey, forcing them to sneak down to the corner grocery to get another one. And another one. And another one. As one of the only TV shows ever to feature Native Americans prominently in the cast, Northern Exposure dealt with its Thanksgiving episode a little differently, by acknowledging what happened after the Pilgrims and the natives broke bread together. In Cicely, Alaska, the Indians spend Thanksgiving throwing tomatoes at the white folks, who smile and wave in return. All except for Joel, who's annoyed that he—a Jew—is lumped in with the Anglos. But by the end of the episode, Chris is delivering a homespun homily into his radio microphone, and everyone's friendly again. Damn, that show was nice while it lasted. After a fight over who gets to use the glue (refereed by Homer, who warns, "Glue friendly or I'll take away the glue and no one will have any glue to glue with"), the tension between Bart and Lisa escalates until he runs away and winds up eating dinner in a homeless shelter. In all the commotion, Homer nearly misses Hooray For Everything's halftime salute to the "dancin'-est hemisphere," the western hemisphere. C.J. tries to decide which of two Thanksgiving turkeys is photogenic enough to get "a presidential pardon and a full life at a children's zoo," and which gets eaten. (President Bartlet: "If the Oscars were like that, I'd watch.") Meanwhile, debates rage over what to do with a handful of Christian Chinese refugees facing imprisonment at home if deported, and what to do about a potential judicial appointee who's bound to make school prayer a national issue. "Shibboleth" features The West Wing creator/writer Aaron Sorkin at the top of his game, giving an inside look into the corridors of power while also exploring what faith, oaths, and grace mean in the real world. All this, plus a heartwarming ending, just in time for the holidays. 17. WKRP In Cincinnati, "Turkeys Away"
Ten words: "As God as my witness, I thought turkeys could fly."